When there is an abundance of fresh cherries we know summer is in full swing. 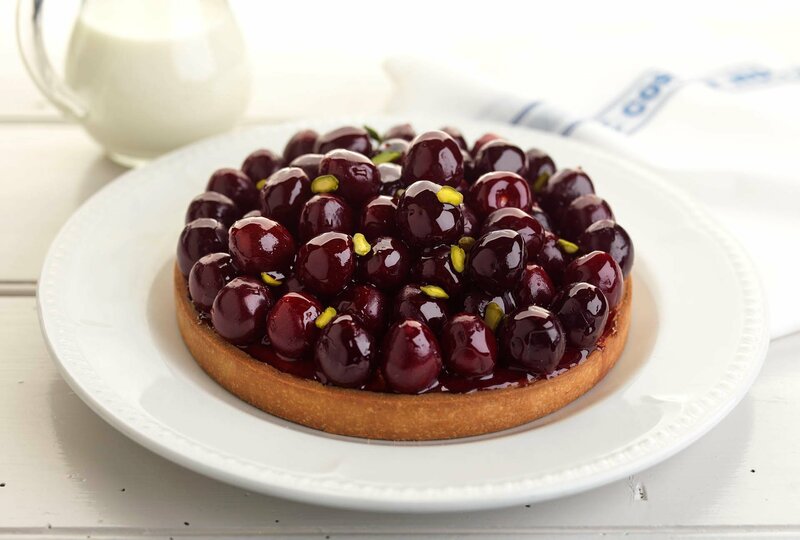 Gentle poaching in Merlot and arranging the fruit on top of an almond cream base show off cherries beautifully. In a large bowl, cream butter, sugar and lemon zest until pale. Gradually add in the egg and vanilla. Sieve flour and salt over mixture and blend until evenly incorporated. Refrigerate until firm, about 30 minutes. Using a cherry pitter remove the stone from each cherry. Warm the wine over a low heat. In a separate pan heat the sugar until it becomes a light golden caramel. Pour half of the wine into the pan with the light caramel and bring back to a boil. Gradually add the remaining wine ensuring the poaching liquid returns to a boil each time. Add the vanilla pod, cook until slightly thickened, then add the cherries and poach over a low heat until slightly soft, about 5 minutes. Remove cherries from the liquid. Reduce the poaching liquid until a thick syrupy consistency is achieved. Allow to cool. Place the tart ring on a baking tray lined with parchment paper. Line tart ring. Refrigerate for 15 minutes. Dock the base by lightly pricking with a fork. Cover the dough loosely with a double layer of heat proof cling film then fill with baking beans. Bake for 15 to 20 minutes, until the pastry looks dull and is starting to colour. Lift out the cling film and beans. Reduce the oven temperature to 160 ˚C. In a large bowl beat together the butter, sugar, lemon zest and vanilla extract until pale and light in colour. Gradually add the eggs a little at a time, beat well in between each addition. Sieve over the flour and ground almonds and fold into the creamed ingredients. Add the Kirsch and mix until smooth. Spoon into the partially blind baked tart shell and smooth over. Return to the oven and cook until a pale golden colour and dry to touch, about 20 to 25 minutes. Arrange poached cherries on top of the cooked almond cream. Using a pastry brush, coat the cherries with the reduced syrup. Chop the pistachio nuts and sprinkle over the tart. This lovely summer dessert is an easy one to pair with sweet wine. You might want to marry colour as well as flavour and go with a red dessert wine that is bursting with the aroma of bright cherries such as a Recioto della Valpolicella Classico. This is a Veneto tradition that consists of harvesting the grape at the normal level of ripeness then concentrating the level of sugar by drying them on racks or by hanging them. The grapes then become like raisins. The grapes on the extremity of the bunches dry considerably more than the ones in the core and will be selected to produce a rich generous dessert wine that is balanced by soft but well defined tannins. The Giovanni Allegrini, Allegrini, Veneto Italy 2011 should be perfect for the task. If you absolutely need to pair your Merlot Cherry tart with Merlot grape you can find some Merlot Icewine in Canada and Eiswein Merlot in Austria, sweet wines made from frozen grapes for the ultimate Merlot experience!